Russia is macho. Resilient. Fearless. But even the strongest of souls will succumb to the trance inducing effect of their local water. Read, vodka. They love the stuff. Alcoholism is more a local hobby. I’m far from preaching. Heck, when I took this shot out of the window of the Trans-Mongolian carriage I was probably under the influence myself. One of my cabin-mates was a Mongolian who was carting two bottles of the stuff home for his craving family. He couldn’t last. He opened the first one at breakfast. The reason I love this image is because it takes me right back to the early days of The Trail. I snatched the image at full speed and have revisited it many times over the past nineteen months. 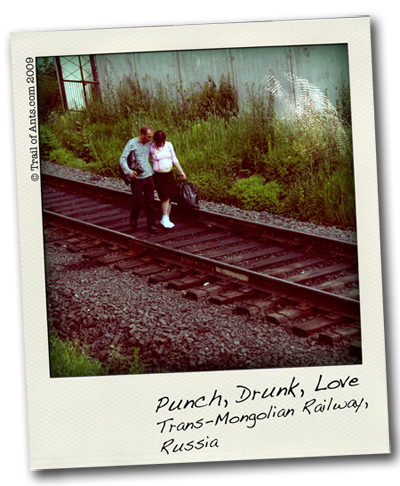 It’s a romantic tragedy in action, as the drunken damsel is helped along the tracks by her lubricated knight. No doubt, they were a long way from home and oblivious to the hundreds of foreigners beginning hundreds of journeys of their own. Cheers. Great photo… how fast was that train moving?? Full speed for the Trans-Mongolian – which is not quite the TGV or the Bullet!